Radiesse® is a calcium-based filler made from a chemical called hydroxyapatite. This is a different chemical altogether than the HA fillers, and therefore, Radiesse has a slightly different look, feel, duration, and side effect profile than fillers like JUVEDERM and Restylane. Hydroxyapatite is most similar to bone in our bodies, and because of this, most experience injectors will only use Radiesse for deep injections. Radiesse that is injected too superficially can lead to more problems with lumps, bumps, and allergic reactions than the HA fillers, but these problems are still very rare in experienced hands. Dr. Nicholas Vendemia offers Radiesse for women and men in the New York metro area. We encourage you to contact us online or give Manhattan Aesthetic Surgery a call at 917-703-7069 to schedule a visit. Dr. Vendemia is a leading cosmetic surgeon in New York City with a reputation for custom care and beautiful results. What Are the Most Common Uses for Radiesse? Smile Lines (Nasolabial Folds). Smile Lines (also called Laugh Lines and Nasolabial Folds) are the most common area that soft tissue fillers are used to treat. Smile lines may or may not be associated with jowls and marionette lines, so don’t be surprised if your plastic surgeon recommends that you treat those as well to have the best result possible. One to two syringes of filler will soften most laugh lines considerably, but more may be needed if your lines are particularly deep, or if you decide to treat the marionette’s and/or jowls. Marionette Lines. Marionette Lines are the lines that start at the corner of the mouth and travel down along the chin in front of the jowl. It is very common for marionette lines to appear at the same time you notice deepening laugh lines and jowls, and one of the most common reasons that patients are dissatisfied when they have their laugh lines treated is because they didn’t treat their marionette lines at the same time. Many patients don’t notice their marionette lines until their laugh lines are no longer an issue, so it is always recommended to treat both together for the best result. One syringe of filler is usually enough to soften most marionette lines, but be cautious when using Radiesse in this area because it can occasionally leads to visible lumps here. 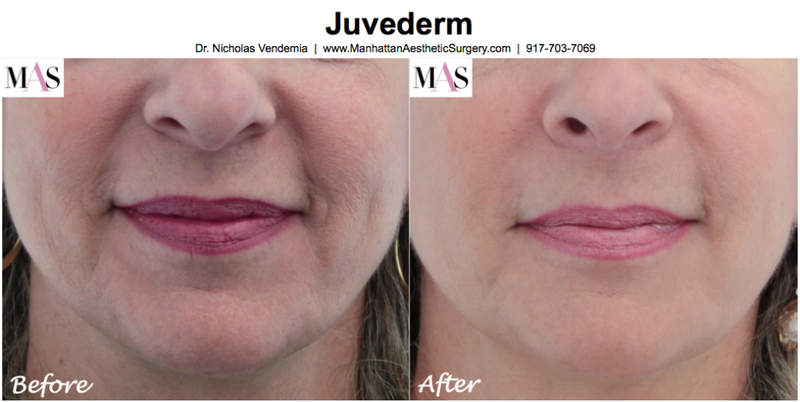 An HA filler like Juvederm is usually a better choice to treat the marionettes. Chin, Jowls, Jawline. This is another area, like the marionette lines, that tends to be overlooked by patients who are having filler injections for the first time because all of the focus is usually on deep smile lines. The groove between the chin and the lower lip also deepens with age, and as jowls grow larger, the jawline looses is youthful smooth line. One to two syringes of filler can go a long way to restoring a young appearing chin and jawline, and disguising the jowls. Radiesse can be a fantastic product to re-contour the jawline. Lips. Radiesse should never be used for lip enhancement. It is much too thick and is prone to lumpiness in the lips. Cheekbones. As the soft tissue of the face descends as we age, it leaves our cheekbones bare and changes the shape of our faces from a youthful heart to an older looking square. Restoring the natural volume of the cheekbone with injectable filler is one of the best ways to take several years off by changing the shape of the face back towards a heart, and when done properly, cheekbone enhancement is one of the most subtle ways to look and feel younger. Adding volume to the cheekbones also provides a subtle lift to the cheek and jowls, which is an added bonus for sure! One to two syringes of filler for each cheekbone will do the trick for most patients. Radiesse can provide a fantastic looking cheekbone. Sunken Cheeks. We all lose volume in our faces as we age, and one of the most noticeable places is in the area just below the cheekbone. Restoring volume to the cheekbone and the sunken area beneath the cheekbone is a fantastic way to take several years off without anyone noticing that you had anything done. One syringe of filler will usually do the job for each sunken cheek. Radiesse is one of the best fillers for this area. Under-Eye Hollows. Under-eye hollows are probably the first thing that men and women notice as they age. Some people even notice these as early as their late twenties! The good news is that they are incredibly easy to treat with a touch of filler. One syringe will usually be enough to treat both under-eyes, but the best result will come from treating the entire cheekbone and under-eye complex at the same time, which usually requires two to 4 syringes. Radiesse should be used cautiously in this area if the skin is thin because small lumps may become visible. An HA filler like JUVEDERM, Restylane, or Belotero is usually a better choice for under-eye hollows. Temple Hollows. The temples are not commonly considered when trying to look younger, but they are a significant contributor to an aging face. The temples can become quite sunken just like the cheeks, so restoring some volume here is just as effective. One syringe for each temple is usually enough to make a noticeable difference. Radiesse is an excellent product for this area. Brows. The outside parts of the eyebrows can sometimes droop a bit as we get older. A touch of filler to this area provides a very subtle lift to the brow by restoring volume to a tiny fat pad located directly underneath the eyebrow that dissolves with age. One syringe is almost always enough to treat both brows, especially when it is used in combination with BOTOX® Cosmeticto relax the muscles that pull the brows down and make them appear droopier than they actually are. You will see the results immediately, but the product will soften and settle over the next 1-2 weeks, and will continue to look better and better as time goes on. Perlane can last up to 12-18 months, but the average amount of time that most patients go between treatments is 9 months. 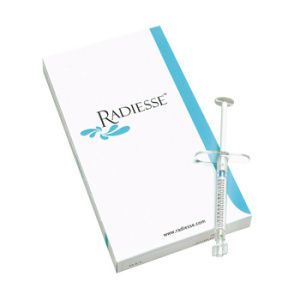 The price range for a syringe of Radiesse ranges from $400 to $800 depending on the skill and experience of the person doing the injecting. Just as you can expect a more beautiful piece of artwork from a well-known sculptor, you can also expect better results from more experience and more highly trained practitioners. There are no real regulations about who is permitted to provide injectable services, so be careful about shopping for the best price instead of the best injector! This is an especially important concern with Radiesse because a bad result will take longer to go away than it will with an HA filler. Absolutely! There are fantastic financing options available. Many of them will offer a period of 0% interest for qualified applicants, and for many patients, the monthly payments can be as low as $100. And the best part of these financing plans is that you’ll know whether or not you qualify before you finish your consultation. For more information about Radiesse or other injectable procedures, please contact us online to schedule a consultation or call our office at 917-703-7069. If you haven’t already done so, check out the amazing results in our Before & After Injectables Photo Gallery by clicking on the image below. We’re looking forward to meeting you!